Some time ago I was challenged by Dwarven player Targ Ironfist and we finally managed to meet on the battlefield (thanks to UB website :)). I had no idea what kind of army Targ likes to play with so I didn't make any in-depth battle plans before the game, trusting my limited experience with Dwarves should be enough. We rolled for scenario and ended up with Blood and Glory, with no modifications to the rules in the rulebook. Solid blocks of infantry, some crossbows for support (but these units also can fight well) and strong artillery meant that this time I had to storm a castle. Which is not exactly what my army likes the best, in particular because I didn't have many opportunities to do so often before. 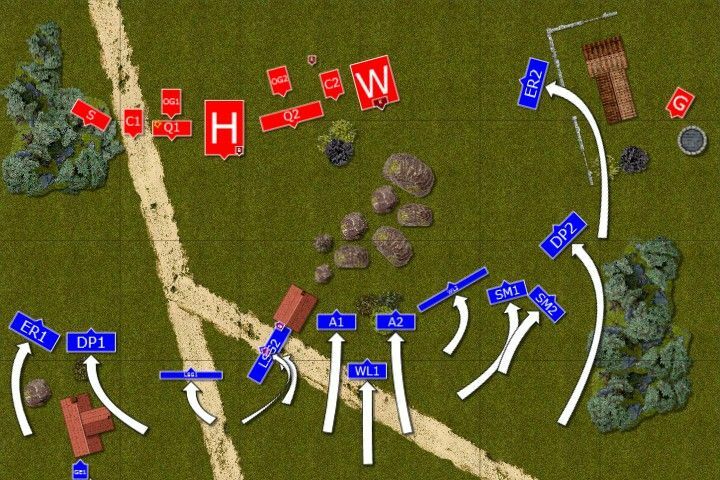 But also because the enemy can create tough formation and does not react much to my movement. No obvious gaps, deadly fire zone and tough warriors all it meant I needed some clever plan to get to the war machines before they thin down my troops or eliminate too many entirely. My army was very similar to what I played with at Wintercon but with some little additions I was hoping to have a chance to test. Some items seem to be useless against Dwarves, namely Crystal and Amulet but that is ok. This is my tournament army after all so I need to take into account situations like that. From previous games I knew my magic will be properly limited and shooting match might not be easy to win. 24" range of Organ Guns gave me some opportunities to maneuver in relative safety, at least in comparison to grudge throwers but eventually I would need to enter dead zone. I wanted to do that with as many units at the same time as possible or use some opportunities to charge with fast troops earlier. As predicted Dwarves assumed their famous castle formation with gyrocopter on the Eastern flank to intercept any light cavalry. Rocks in the middle of the battlefield provided hard cover. I wanted to use that to move my archers in and shoot at crossbows as well as have it as protection for my combat units who by necessity had to perform wide outflanking move. 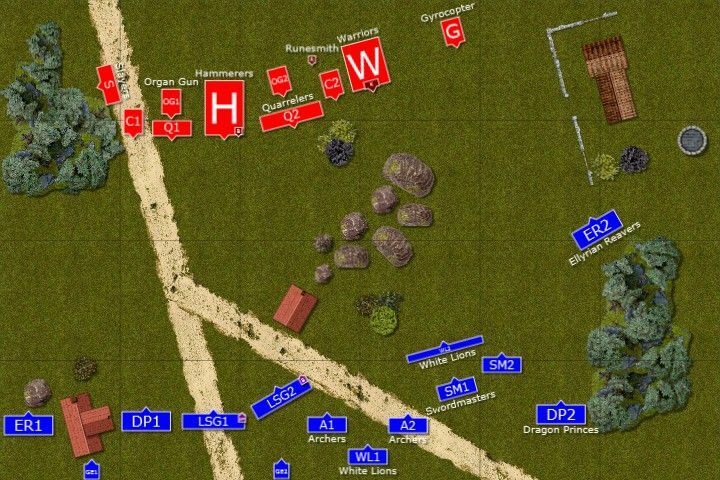 On the West I wanted to use both Sea guard units to kill some crossbows and help cavalry and eagle positioned there to achieve good position to attack artillery. 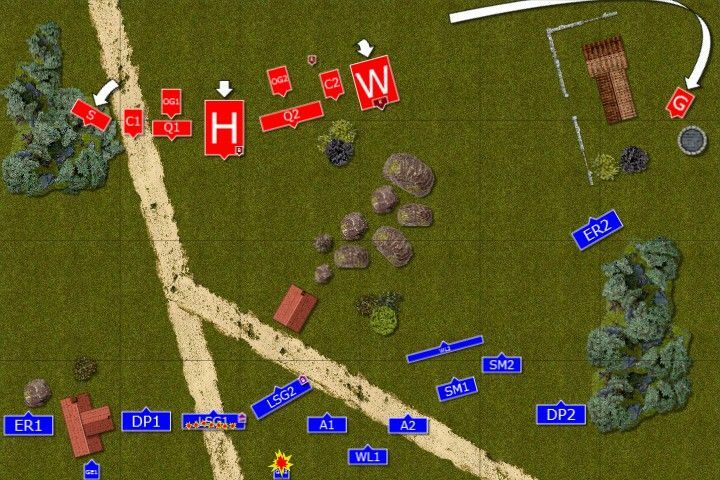 And as soon as other regiments on the East are in position too - attack all at once. Dwarves naturally won the roll-off and theirs was first turn. Archmage had following spells: Curse of Arrow Attraction, Fury of Khain, Flames of the Phoenix, Vaul's Unmaking and was with Sea Guard positioned further to the East. BSB joined the other regiment. In Dwarven Army BSB joined Hammerers, King was among his Warriors while Runesmith was alone nearby middle organ gun. Dwarven army re-adjusted its formation slightly with only gyrocopter flying far to the Eastern flank. All war machines and quarrelers who had the enemy in range opened fire and as a result half of the unit of the sea guard and one great eagle perished. Units in the center and on the Eastern flank moved forward with one Swordmaster unit performing rear guard duty in case the gyrocopter decided to go behind elven lines. On the West units moved slowly, aware of deadly artillery. Sea guard and BSB aimed at small quarrelers unit but due to good armor and runic protection only 1 Dwarf died. Not exactly the reply Elves wanted to send. With no need to change anything in their impenetrable formation, Dwarves move only a little. Warriors move backwards and King moves out of the unit to prevent any back door openings for swift elven cavalry. Ellyrian Reavers are also attacked by gyrocopter and lose 2 due to steam cannon but are not impressed and keep running towards the enemy lines. Shooting match continues and this time sea guard warriors from another regiment are the target. They suffer some casualties too but hold on. Archers moved a little too much forward and entered the range of organ gun. Dwarven crew does not miss the opportunity and a few archers dies. One unit of Swordmasters could talk about luck when cannon ball arriving from their flank hits only single warrior before bouncing further. Ellyrian Reavers on the East spotted the cannon and attempted to charge but realized it is still too far away. Dragon Princes followed and infantry tried to realign its formation. Cavalry on the West moved a little bit forward to be ready for charges while sea guard aimed at quarrelers again and this time did absolutely nothing. Archibald the Archmage was bored. All this running here and there made no sense to him. He was also in bad mood as he could not take his favorite robes for this battle. He was leaning against the door of the house his unit was positioned next to. Then he spotted a poster and as he was well versed in dozens of languages he easily read the title "House Party!!!!" and his good mood returned. Memories of good old days in the student house when he practiced his arts at one of the faculties of White Tower came again and his mood was improving. He didn't think much, opened the door and begun the search for the room where the party was about to start. Bob the Battle Standard Bearer was really concerned for his companions and decided they should withdraw. Then Archibald disappeared in the house. Bob ordered his troops to run into and drag silly Archmage out before it is too late. When he spotted the poster, seemingly written by human hand in human language but way too neatly and regular. He knew it's a trap. As soon as Dwarven crews spotted the Archmage in the building everything opened fire at it. It was a deadly trap and after heavy barrage no living soul remained in it. Actually, there was no building anymore. The rest of the elven army, still out of position and leaderless decided to withdrew. This time Dwarves got an upper hand. 1. 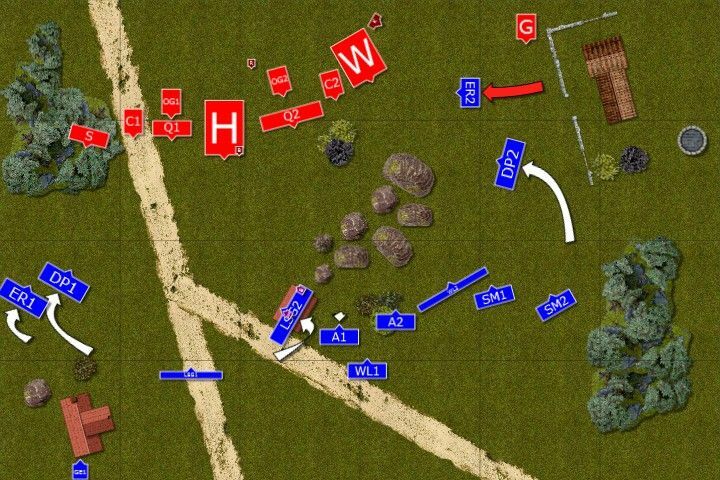 I didn't really play against gunlines before and lack of experience showed. If I wanted to engage enemy units in shooting duel I should have focused all of them on one target, not only sea guard. 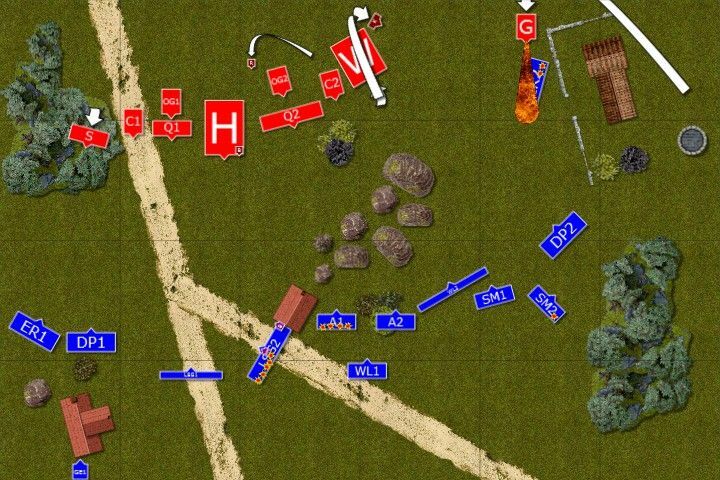 Thanks to that I could have freed 2 cavalry units to run on the open plain on the East. 3. Rocks in the center were as good as they were a problem. I could get some protection against crossbows thanks to them but I could not enter it with cavalry. They were not any problem for cannons and organ guns though so I was still a sitting duck there. Because of that I moved widely but then ignored gyrocopter which I should not. Last but not least congratulations to Targ. He played patiently, had a solid position and exploited mistakes I made. A well deserved victory no doubt!